Doing international shipping and international moving is exciting, but it can also be difficult. Chances are good that you will do this only once in your life, and most people will never do it. Therefore I have written this guide to outline how the process works and to help you make informed choices, especially about how to prepare and how to choose an International Shipping Company. This is primarily written for people shipping from the United States, although it applies to anyone who is shipping goods abroad. Also, this is written for people shipping household goods for personal use. May you have a successful move! Many people and companies are involved in an international shipment, and it will help if you understand who they are, what they do, and how they work together. You will likely have direct contact with only one or two of the companies involved and little or no contact with the others. However, all are discussed below. This is you, the person doing the shipment. You are also the “Exporter” (the person exporting goods from the country of origin) and the “Importer” (the person importing goods into the destination country). It is very important that you understand that as the “Shipper” you are accepting responsibility for the legality of the goods that are being shipped, any import duties, supplying paperwork, and, most importantly, any charges that might arise in the event of some unusual occurrence like a port strike, a customs inspection, or an unusual delivery situation. Therefore you need to make sure that you know all of the rules for importing to the specific country to which you are shipping. You should also budget extra money in the event that it is needed. I use the term “Move Manager” to represent a function that can be performed by any of several people or companies. The International Shipping Company you choose will be your Move Manager. It is the company that will oversee your shipment, it is the company you will sign the contract (or agreement, or estimate) with, and it is the company that will be sending you your bill. It is the company you will turn to in the event of any claims for damages, updates on your shipment, and general questions about the process. All of the other entities involved with your shipment will be “employees” or “subcontractors” of the International Shipping Company/Move Manager. Since your agreement will be with the Move Manager, any problems or concerns will need to be addressed to the Move Manager, and any disputes will need to be settled with the Move Manager. This is the local company that will do the visual survey, i.e. it will send someone to your home to see what is being shipped before quoting for the move, in order to give an accurate quote. The Origin Agent will also pack and load the shipment. The Origin Agent might also be the Freight Forwarder, the Consolidating Warehouse, and/or the Move Manager. See below for details on these other functions. This is the company that will arrange the ocean freight and do the export documentation (including a “House Bill of Lading”, i.e. a document showing information specific to your shipment such as your name). This is also the company that will move your cargo from the pickup point to the port. In many countries, including the United States, a Freight Forwarder is supposed to be licensed. You can easily check to see whether the Freight Forwarder you want to use is licensed at http://www.fmc.gov/ (the website of the U.S. Federal Maritime Commission, or FMC). 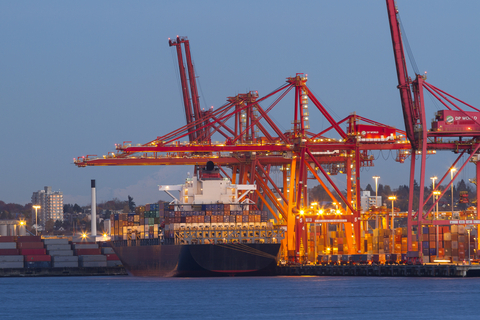 Note that the Federal Maritime Commission makes a distinction between a Freight Forwarder (FF) and a Non-Vehicle Operating Common Carrier (NVOCC). However, for the typical customer doing international shipping, the difference doesn’t matter, so when I say “Freight Forwarder”, I mean either a Freight Forwarder or an NVOCC. You might also choose to work with a Freight Forwarder in the destination country. This can be particularly useful if you are moving to a country with unusual rules for import or if English is your second language and you are moving to a county where your native language is spoken. The Freight Forwarder may also function as the Origin Agent, the Consolidating Warehouse, and/or the Move Manager. If you do not have an exclusive container (an ocean container holding only your shipment), your goods will need to be loaded into a container with other cargo. The decision about whether to use an exclusive container will be made based on the volume of your shipment and the distance between the origin city and the port of embarkation. If your goods need to be consolidated, they will wait in a warehouse called a Consolidating Warehouse until there is enough cargo to fill a container. If you live near a port city, this will probably – but not necessarily – be the same warehouse as the warehouse of the Origin Agent. If you live far away from the port, your goods will be sent by truck to the Consolidating Warehouse. For the most part, this process will be “invisible” to you, although it is quite possible that goods will seem to move in the wrong direction before being loaded onto a ship. For example, cargo going from Cleveland, Ohio to London, England might be moved to Chicago, Illinois to be loaded into a container in Chicago because it is less expensive to do it that way. The Consolidating Warehouse may also function as the Origin Agent, the Freight Forwarder, and/or the Move Manager. This is the actual port where the container is brought (already loaded and sealed) to be loaded onto the ship. For practical purposes this means nothing to you, as you won’t be dealing with it in any way. The only important thing to know is whether the Origin Port Fees and Origin Terminal Handling Charges are included in your quote. They will usually be listed as “Origin Port Fees” or “OTHC” (Origin Terminal Handling Charges). For shipments going from the United States, these fees are regulated and relatively low and they are almost always included; however, it is worth checking to make sure. Ship Lines have the right to overbook, and “roll” cargo to the next available ship. Any associated costs get passed on to the shipper (that’s you!). Ship Lines have the right to declare “End of Voyage” in the event that the destination port is not available due to war, port strike, or other unforeseen event. Any extra charges get passed on to the shipper (that’s you!). Ship Lines have the right to jettison cargo (throw it overboard) in the event that the ship gets damaged or might sink otherwise. If this happens, the Ship Line is not liable for the loss of cargo. Ship Lines can change schedules, routes, or almost anything else in the event that they need to (even if the need is strictly financial). You know who pays for this by now, right? Ship Lines are not responsible for any damages to cargo, or any related damages caused because of a late arrival or no arrival of the cargo. Ship Lines must get paid before they will release the cargo. This is slightly simplified, but you get the idea. Ship Lines do have some rules and standards, as well as some obligations, but by and large, particularly for the one-time shipper, they are untouchable. So make sure you have some extra money on hand in case of a tidal wave or port strike. Usually 10%-20% of the total price quote will be enough to cover it, and these instances of extraordinary circumstances are rare and easily verifiable by asking the Ship Lines directly or by looking on the Ship Line bill. The most important thing to remember is that Ship Lines work on a “highest priority” basis, and household goods (what you are shipping) is the lowest priority. The Ship Line might also be the Container Line (see below). The Container Line is the company that owns and rents out the ocean container. This may or may not be the same as the Ship Line, but for all practical purposes it won’t make a difference to you. This is where the goods are finally unloaded in the country of destination. You will usually have no dealings with the port. However, you will owe them money! It is very important that you check your price quote to make sure that it includes Destination Port Fees and DTHC (Destination Terminal Handling Charges), or at least shows what they will be. Note – In giving quotes for international shipping, it is routine but almost always unacceptable to exclude Destination Port Fees. These fees are usually due in the currency of the destination country, and they will often be listed as “not included”. The quote you accept should include them or at least show what they will be. Even if they are not listed, you must pay them, regardless of the amount. In some very rare instances (usually in third-world countries) it is impossible to know these fees in advance. However, you can always check with an International Shipping Company located in the destination country to see whether that company can tell you what those fees will be, and you can also arrange your shipment through that company. If you can’t find out the amount of the Destination Port Fees in advance, expect them to be $1,000-$2,000 or more, no matter the size of your shipment. This is the destination warehouse where your goods will be held until they clear customs. How this is handled will vary from country to country. For example, in Canada the shipper must be present when the goods arrive. In the United States, an entire incoming container is cleared through customs at once, even if there are multiple shipments in the same container. In some other countries, however, containers with more than one shipment must be unloaded and each shipment cleared through customs individually. It is important to find out how this process works and how much time you have before storage and other charges start. This is the company in the destination country that will handle the customs clearing procedures, dealings with the port, and delivery to your residence. You can use the Destination Agent as your International Shipping Company/Move Manager to arrange for the entire shipment. Although it is standard to use a company in the country of origin, if you are moving to a country with unusual laws regarding personal imports, or to a country where your native language is spoken, it might make sense to do this. A Broker is a Move Manager that does not do any of the other work. A Broker is not to be confused with a Freight Forwarder that might subcontract the Origin Agent and the Destination Agent, because the Freight Forwarder is doing something vital to the international shipping process even if you don’t see it being done. Generally speaking, Brokers are unlicensed. In most countries, this is illegal, but since international shipping is done by such a (relatively) small segment of the general population, there is usually no enforcement until many, many complaints have been filed. They may not use the same set or quality of services that another company might choose. They may not check actual costs until after you have chosen to use their services, and then they may raise the prices through some loophole in their agreement. They do not pay any fees to be properly licensed. Because of this, a Broker might give you what appears to be the lowest price, but either it ends up being more expensive than the original quote or you get a lower quality of service (more damages, more delays, more problems, more of your $$$ to fix). Most important, a Broker has no one checking his financial stability. If you pay a Broker and he doesn’t pay the Ship Line, you don’t get your goods! In contrast, the Federal Maritime Commission requires a bond from its licensees, and respected industry trade groups such as FIDI-FAIM check the financial stability of their member companies. Now that you understand who will be involved in your international shipment, let’s get down to the nuts and bolts. The below “do not’s!” are based on advice from the Federal Maritime Commission as well as on my years of personal experience in the industry. No one wants to pay too much for a service, but international shipping is not a product in a box – it’s very difficult to compare prices and services as you would with a TV or a car. This is a sure-fire way to run into problems. Scammers prey on greed and ignorance. You probably don’t know everything about international shipping (even smart people don’t), so don’t be greedy! If you go on line to one of those “Find-a-Mover” websites and pick the lowest quote you get, rest assured you will have many problems and your final bill will be much higher than the low quote you (thought you) agreed to. While price should be a consideration, it should be one of the less important ones. Always remember that the price that is most likely to be quoted is NEVER the total amount that you will pay. You need to see what is NOT INCLUDED in the quote, and find out what that will cost too. Also keep in mind that especially for small shipments, it is quite possible that the cost of shipping will be more than you can afford or more than the goods are worth. If that is the case, you will be “ripe pickings” for a scammer or unethical salesman who may offer what appears to be a low price but in fact does not include all of the fees you will need to pay. If you hear the line, “You know better than some stranger what you want to ship!” run! The visual survey is the best way to sort the good from the bad in our industry. It is more than just the surveyor seeing what is being shipped, although that is a big part of it. The survey allows the surveyor to see the house and the street you live on, what size truck can fit, what the parking regulations or restrictions are, and many other factors that are important in determining the cost. Also, the visual survey allows you to see a representative of the company that will be doing the packing and find out the company name and address and a little about it. It allows you to weed out the Broker working from a basement in some remote city (or country!) before he has your goods and you have a problem. The only case where a visual survey might not be possible is if you live more than an hour from the nearest moving company. In most of the world, that is not an issue, so in most of the world, accept quotes only from companies that send a surveyor. Think about this – you would never call a dentist and say, “My tooth hurts – what will it cost to fix it?”, would you? When you order international shipping services without a visual survey that is exactly what you are doing! It won’t matter what the salesman said (or didn’t say) on the phone; it matters what is written on the agreement. So if you don’t want to read it, don’t complain when you find out what the price doesn’t include, and be prepared to pay for it. So you now know what not to do. Now let’s talk about what TO do. International shipping is expensive. It makes no sense to ship something only to arrive at destination to find you won’t or can’t use it, or should have thrown it away years ago. Find out the size of home you will be living in and what you will want, use, or need. This is a good time to get rid of things you should have gotten rid of years ago, even if you can’t sell them. Note – Homes in North America are generally much larger than in other places. Check standards for things like door sizes, electricity, and room/house sizes in the destination country to help determine what should not be shipped. Note – You will notice I did not mention going to the nearest search engine and doing a search on “International Shipping”. This is on purpose. Do NOT do this! Three companies is enough to get an accurate idea of competitive costs while not killing yourself with reviewing estimates, comparing prices, and having surveyors come to do a visual survey. Do a walk-through of the house to determine what must go, what might go, and what won’t go before the surveyor arrives. Make a list, and add in what you think it would cost if you needed to replace the items (this will be useful later – see the discussion under “Insurance” below). Try to schedule the three surveys as close together as you can, even at different times on the same day if possible. If you are married, make sure both spouses are at home during the survey. Get a written copy of the survey sheet and review it. Be honest, both when you are showing the surveyors what is being shipped and when you are reviewing their lists afterward. If you have four children and the survey sheet shows only two boxes of toys, something is wrong! If the living room is filled with knick-knacks and books and the survey sheet shows three small boxes of items from the living room, there is a problem! Note – You will pay for the final volume and weight once the goods are packed. Make sure the survey sheet shows accurately what is going and what isn’t. Pay special attention to the number of boxes listed, especially if you plan on taking much less than you currently own. The surveyors have come and gone and now you have the quotes. The first thing you do is scroll down to see the numbers, right? Big mistake! Ethical salesmen spend a lot of time putting together the price quotes and outlining what is and what is not included. The terms and conditions, while they may be in fine print, are very important. Unethical salesmen make a living because most people don’t read the quotes! If all you are looking at is the “price” you are missing the total cost. Read everything, and what you don’t understand, question. Get the answers in writing. It might help to make a spreadsheet so you can compare the entire cost, not just the “door to door” cost. Pay special attention to what is NOT included! This is where you will find what are going to be the extra charges, and you must know in advance what is going to be due (as opposed to may be due). Note – Destination Port Fees and Terminal Handling Charges are routinely excluded from door-to-door quotes. Make sure your quote shows, in writing, what these fees will be! Never assume that one company will charge the same as another company for these fees. I know that this might mean a few hours of reading, but you are going to be spending quite a bit of money (possibly as much as a car would cost!) and you will be handing over almost everything you own to the International Shipping Company. Take time to read and understand what is involved! Once you have read the pricing, the terms and conditions, and everything else, you will have questions. There may also be specific services you require or want. If it is important, get it in writing. If it is not in writing, it doesn’t exist! In the event of a dispute, the first thing that will be reviewed is the written agreement and other written correspondences. It’s a good idea to follow up phone conversations with an email to make sure there is no confusion and to make sure that you get a response, in writing, from the International Shipping Company that matches your needs, desires, and expectations. Insurance (or “Valuation” or “Coverage”) is never included in the cost. The cost of insurance is based on the amount of insurance you need and the deductible you choose. Insurance can be either “Total Loss” or “All Risk” (these terms are explained below). If your goods are not insured, you cannot claim damages, even if you see the worker drop the box! Insurance is based on you insuring your entire shipment for what it would cost to replace new in the country of destination. You will need to make a list of what you are shipping and how much it will cost if you have to replace it new in the country of destination. This last point may seem a little odd, so I’ll explain it here. Your cargo is probably worth much more than the cost of shipping it. If it wasn’t, you likely wouldn’t ship it. However, the International Shipping Company has no way of knowing what the value of that cargo is. (Remember, most cargo is commercial.) Further, the value of the cargo is usually way, way more than the average profit on a given international shipment. U.S. Army – one 20-foot container of top secret material – ????? Hopefully this will give you an idea of why it is fair for each shipper to pay for his own coverage and why that is the only practical way to do it. This means that the cost of insurance must be considered as part of the cost of the shipment, and it is usually not optional! While the terms of Marine Insurance policies vary from company to company (and have to be read! ), there are some similarities. First, you can get either Total Loss or All Risk Insurance. “Total Loss” means that you can make a claim only if your cargo is considered a “total loss”. In simple terms, this means you don’t get any of the cargo back, but you get a check. Note – Goods that are owner-packed are almost always covered for Total Loss only. “All Risk” means that you can make a claim if a dish breaks or a piece of furniture gets damaged. Usually you are given a period of time after the delivery day to go through everything and file a claim for what is missing or damaged. Regardless of how many pieces are missing or damaged, you can usually file only one claim. You have a dining room table that is worth $5,000. But you want to save some money, so you insure it for only $2,000 (40% of its replacement value). The table arrives damaged and the repair will cost $1,000. The insurance company will pay that claim at 40% (meaning $400) based on the fact that you insured it for only 40% of what it is really worth. Last but not least, you will need to supply a list of what you are shipping and what it will cost to replace, as new, in the destination country. While all Marine Insurance Companies will have a different form to fill out, they will all want the same information, so get started on the list early. This is also where the group of people familiar with the destination country that you met online or in person can help – they can tell you the cost or availability of the items you want to ship. It might be that your dining room table will cost twice the original price to replace or isn’t even available there. Always add the cost of shipping to the value of insurance. If the truck arrives at your house and your goods are totaled, you not only have to buy new goods, you still owe (or more properly have already paid) the cost of shipping! So if your totaled goods are worth $10,000 and it has cost you another $3,000 to ship them to the destination country, you need to buy $13,000 of coverage. One of the ways to reduce the cost of international shipping is to reduce the services you require. Keep in mind, however, that this may not make a big difference in cost but it will make a big difference in the chance of damage and your ability to file a claim against damage. It might also increase your chance of a customs inspection and associated extra charges. In a full-pack move, the International Shipping Company will pack all of your goods – boxes, clothing, dishes, etc. – as well as wrap your furniture. It is important to check that this service includes packing materials. If not, expect very high charges for packing materials! With full-pack service you can almost always get All Risk Coverage. Sometimes it makes sense to do a partial pack. This means that you pack non-breakable items like books and clothing and the International Shipping Company packs breakable items like dishes and wraps furniture. Items that you pack will have limited coverage (usually only for Total Loss and only if you provide a list before pickup of what is in each box and what the contents are worth). Check to see whether the International Shipping Company will supply materials for goods that you plan on packing, and if it won’t, consider the cost of buying proper packing materials and boxes. The least expensive option is to load the container yourself. The reason for this lower cost should be obvious – you will be doing all of the hard work, supplying all of the packing materials, and assuming all of the risk of damage. Unless you have experience as a professional international packer, this is not a good option. Consider shipping fewer goods to save money instead. Note – The more goods that are packed by the shipper (you), the greater chance there is of a customs inspection and extra charges associated with the inspection. Many International Shipping Companies will try to sell you services only “To Port” in the destination country. Their quote will be much less expensive than a door-to-door quote because it is not inclusive of all of the fees you will need to pay (even if you plan on hiring a truck to pick the goods up at port!). A quote “To Port” will never include any of the Destination Port Fees or Terminal Handling Charges that will be due! Also, many Ship Lines and/or Container Lines will not release a container to an individual without getting a large deposit. Lastly, ports often give people a very limited amount of time to clear the container from customs and remove the container before costly charges start. In short, if you don’t already do regular shipments to the destination country, if you don’t already employ a licensed customs clearer, and if you don’t already have agreements with the foreign port, Bonded Warehouses, and Ship Lines, do NOT take this option. If you want to save some money by not having delivery service, ask for a quote “To Warehouse, Customs Cleared”. Then you can have a truck pick the goods up at the Warehouse. Even used household goods may be subject to import duties. It is important to find out what the exemptions are in the destination country, what you will need to do to get those exemptions, and what the customs fees (duties) will be for items that are not exempt. Since the International Shipping Company usually doesn’t know the exact address where you will be moving, it will offer a price making some assumptions. For example, it will assume that there will be room on the street for a relatively large truck, that the truck can park relatively close to the door of the house or apartment, and that the movers won’t have to carry the goods up more than one or two flights of steps. If those assumptions are wrong, there will be extra charges. If you don’t know where you will be moving, find out what these extra costs might be so you can keep them in mind when looking for a place to live (and you won’t be surprised by the bill). Items like safes or pianos require extra labor and/or special equipment to move. If the surveyor sees a piano when he comes to the house, the associated costs should be listed. Even if they do not appear on the quote, however, assume that there will be extra charges for such items. In the event that Customs wants to check what is in the shipment (either on export from the origin country or on import into the destination country), there will be extra charges, and they will not be included in the quote. The shipper (you) will need to pay these charges. This is a legal term, and it basically means “Anything that can’t be predicted or controlled”. Some examples would be a war, a port strike, or a natural disaster. The shipper (you) will need to pay the extra charges associated with such events. Note – If an item below is listed as “Not Included”, find out, in writing, what it will cost. This basically means the fees that will be charged by the destination port, the destination Ship Line offices, and the destination Bonded Warehouse. Because of differences from language to language and country to country, the fees may show up under any of the above names, but if they are not listed in writing, get them! It is very important to find out the cost of the packing materials, especially if you are getting full-pack service. Omitting the cost of these is a simple way for a salesman to hide a big fee. This is the process of turning over all of the paperwork to the customs officials in the destination country and dealing with whatever issues arise. The charge for this is usually relatively little and it should be a standard part of door-to-door services. It may seem odd that this would be listed as “Not Included” on a door-to-door quote, but it is an easy way for an unethical salesman to offer a seemingly lower price than the competition, especially if the customer doesn’t read the quote. You’ve reviewed the three quotes you got that are based on visual surveys. You’ve reviewed what is and what is not included in those quotes. · You’ve made sure that the quotes include what you will need to pay. You’ve budgeted some for what you might need to pay, just in case. You’ve calculated how much insurance you will need, and what it will cost. You’ve come up with three totals, one inclusive of everything that can be predicted, one inclusive of insurance, and one inclusive of a little extra just in case. You’ve gotten an idea of what type of Move Manager each International Shipping Company will provide and how well you and each Move Manager communicate. Now you’re ready to make your choice. If you’ve gotten this far in the process, the choice will probably be pretty obvious. Choose the International Shipping Company that is able to provide the services you want and need and a Move Manager that you will feel comfortable with over the next few weeks or months while your goods are in transit until they arrive at your new home. This is a partial list of some useful trade groups and consumer and moving industry websites. This is a partial list of the major van lines in the United States.